Take care of your hot tub cover in cold weather for savings and security. You know the old saying “Keep a lid on it”. Bet you didn’t know this saying applies to your hot tub! Your hot tub cover is the only thing between your Hot Spring Spa and the frigid air and blowing debris that can run up your electric bills and cloud up your water. If you don’t have a well-fitting, functional cover, get one here. If you do, here’s how to keep it effective during the winter. CLEAN. Hose off the cover. Wipe it down with a clean cloth or soft sponge. Repeat until it’s fairly clean. Spray on a non abrasive cleaner like Simple Green and rinse. CONDITION. Aerospace 303 Protectant keeps the vinyl supple and prevents drying during harsh winter weather. It’s like sunscreen, protecting against sun damage to the vinyl, and it repels dust, dirt and stains (Armor All seals the vinyl and hastens aging). Even if you don’t condition every month, at least give your cover a treatment before the snow and ice come. CLEAR. When the snow and ice fall, sweep off the accumulation with a soft broom to preserve the foam cores without harming the vinyl. Never use a rake. HANDLE WITH CARE. Vinyl doesn’t stretch, even though it’s rated not to crack at temperatures well below zero, so be gentle with the straps and handles. SECURE. If your tub is on a roof, bluff, seashore, mountain or other high exposure spot, or your winter storms are windy, lock down the cover with Windstraps. They’re padded, easy to install across the top, and you won’t have to worry when the wind blows. Note: At Olympic Hot Tub, our biggest cover sale days come after a big windstorm – inadequately latched covers get blown away. 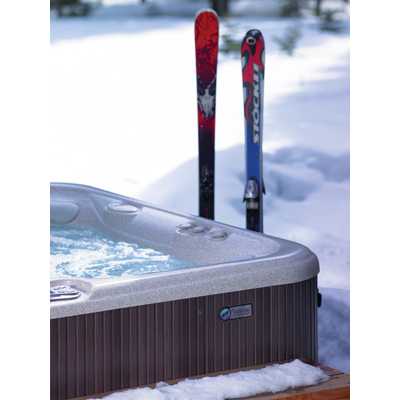 By keeping your hot tub top in top shape this winter, and you can relax. Res severa est verum gaudium as the Romans said it. Pleasure is a serious business. 6 Signs That You Need a New Hot Tub Cover NOW!